Cloud technologies are dramatically reshaping how we all work and live, and businesses today are under tremendous pressure to keep up with the pace of change. The resulting disruptive technologies and business models are creating new opportunities to engage with co-workers, companies, and customers. However, the impact isn’t always positive. Workers today are using an average of four communications apps and checking these 10 times an hour—leading to 32 days of productivity wasted each year. The goal of the digital workplace should not be to just provide technical endpoints, but also human connections. This is the intention of Collaborative Communications and it is happening today. 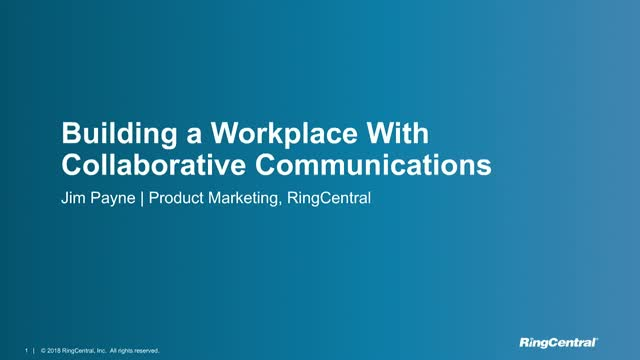 In this engaging presentation, learn how the vision for Collaborative Communications is made possible by RingCentral’s powerful capabilities to call, message, and meet—all delivered with an integrated experience. Are you concerned about the advancement of AI and cloud technology and how they will impact your business communications? Or perhaps you’re looking for ways to get your business communications AI ready? If you answered yes to either of these, then save your spot at this webinar now. The hype surrounding AI and its imminent take-over of the business world is creating a sense of panic. But whereas AI, just like cloud technology, is sure to become a driving force as we look to the future of business communications, there is no need to jump in at the deep end and throw all your resources at it just yet. Join us for this webinar in which we’ll explain the current state of play for AI (spoiler alert: humans are not going anywhere for a while) and cloud technology and impart some useful ways you can prepare your business communications. How we work has changed. Email and instant messaging aren’t sufficient to meet the demands of current business workflows. At the same time, customer-facing workers need to build stronger relationships and foster trust quickly and efficiently. Learn about how unified communications and cloud collaboration tools are empowering today’s businesses to operate more effectively, facilitate streamlined collaboration, and make a difference with customers. You'll hear from leading industry experts on how UCaaS is rapidly changing business communications, processes and workflows in 2017. With the eve of the new year upon us, the time to begin anew with fresh perspective is here. As you look forward and begin to plan how you’re going to shape your 2016 IT communications infrastructure, keep your eyes on the several emerging and continuing enterprise communications trends -- such as the rise of team collaboration solutions, the death of the traditional desk phone, the continued shift to enterprise text messaging, and the rise of predictive communication. Please join us as we take a look at the top 8 trends in enterprise communications for 2016. Join us on December 18th to learn how you can reduce costs and boost productivity with an enterprise-grade communications platform integrated into your favorite business apps including Google, Office365, Salesforce, and others. This live demo will show you how RingCentral creates a comprehensive communications hub that is very simple for end-users to adopt and use, and for IT to manage. You can initiate PSTN calls and SMS, host meetings and video conferences, view screen pops with relevant information, and more, without having to click around from one tool to another. Technology can empower smarter, more efficient and productive team collaboration. But before jumping into a new product, companies must first look at how employees are collaborating both at work and home. Gartner predicts “by 2020, over 90% of enterprise voice calls in the digital workplace will originate from collaboration applications, up from 30% today.” An MIT study reveals that 36% of workers’ time is spent in inboxes -- which is a deterrent to teamwork. MIT also states that the quality of team communication defines the success of a team. Join us on December 11th to learn how you can reduce costs and boost productivity with an enterprise-grade communications platform integrated into your favorite business apps like Salesforce, Zendesk, Office 365, and others. This live demo will show you how easy it is for team members to initiate PSTN calls and SMS, host meetings and video conferences, view screen pops with relevant information, and more, without having to click from one tool to another --from anywhere, any time. How are companies like Cresa gaining efficiencies and deepening customer engagement through cloud communications, collaboration, and integration? In this thirty minute webinar, learn how the latest cloud communications applications equip employees to thrive in today’s world of work. Are you interested in saving time, responding to your customers faster, and being able to communicate efficiently from anywhere, on any device? Join us on December 4th to learn how RingCentral’s cloud-based communications platform integrated into your favorite business apps like Google, Office 365, Salesforce and others can help boost productivity and reduce costs. This live demo will show you how easy it is for team members to initiate phone calls and SMS, host meetings and video conferences, view screen pops with relevant information, and more, without having to click from one tool to another -- from anywhere, any time. In this fast-paced, informative webinar, you’ll learn how to drive agility with mobile cloud communications that engage prospects faster. • Enable your team to use the leading business communications solutions from within Oracle Sales Cloud. • Deepen relationships by communicating the way your customers and prospects most prefer. • Save time and increase business agility. Productivity matters to everyone, but the pressure’s really on if you carry a quarterly sales quota. This demo shows new, more efficient ways to communicate with enterprise-class cloud communications integrated into Salesforce and Desk. Learn how users can initiate PSTN calls and SMS, host meetings and video conferences, view screen pops with relevant information, and more, without leaving Salesforce or Desk. It’s no secret that the purpose of having people answering phones in a contact center is to help customers purchase your goods and services, and then keep them happy after the sale. However, achieving these goals is difficult for many companies because they rely on contact center technology leftover from an era when the voice phone call was king. Meanwhile, the consumer—and even the B2B customer—has moved to using multiple channels of communications: voice calls, email, online chat, SMS, and social media. In this webinar we will discuss the benefits and opportunities of an integrated and multi-channel cloud contact center for both customer and agent satisfaction. Communications for business is moving to the cloud for easier tools for teams to meet, collaborate, and get their job done. However, the traditional “build it and they will come” approach to deploying Unified Communications and Collaboration (UC&C) drives less than optimal results because knowledge workers frequently grab a set of tools on their own, creating islands of knowledge and collaborative work. The discussion around collaboration is extremely hot. Gartner predicts “by 2020, over 90% of enterprise voice calls in the digital workplace will originate from collaboration applications, up from 30% today.” An MIT study reveals that 36% of workers’ time is spent in inboxes—which is a deterrent to teamwork. MIT also states that the quality of team communication defines the success of a team. In this webinar, learn how technology can empower smarter, more efficient and productive team collaboration. The value of cloud applications such as Microsoft Office 365 is not just in the ability to simplify usage and management, but in integrating with other often-used cloud business applications, such as communication tools. The ability to manage and track all business communications in one place—calls, texts, faxes and voicemails—and to make and receive calls directly within Office 365, are both productivity advantages that integration can deliver. In this presentation we will discuss the benefits of an integrated Office 365 and business communication system for both IT and the end user. Zero Motorcycles of Santa Cruz, California is the world’s top producer of electric motorcycles. Achieving a leading position with only 100 employees might seem surprising, until you realize that everyone at Zero is focused on channeling resources into production. “Given the choice between making better motorcycles or investing in phone systems, the vehicles win out,” says Director of Customer Experience Aaron Cheatham. This isn’t to say that communications aren’t critical to the success of the company. Cheatham says that Zero chose RingCentral’s phone system because it does everything Zero needs—and then some—without breaking the bank. Watch the video to learn how RingCentral helps Zero Motorcycles stay connected, service customers more effectively, and continue building their brand. This Friday’s live online demo showcases how RingCentral helps you collaborate with colleagues throughout the world with cloud-based voice, email, chat, SMS, audio and web conferencing. You’ll also learn about RingCentral Global Office, an additional service that allows your company to expand your current phone system to international offices in supported countries. See how to add your international offices’ extensions into your current account to easily manage one cloud phone system across international offices. Enjoy efficient office-to-office communications with free extension-to-extension dialing and cost-effective international calling with competitive dial plans. Our Sales Engineer will show you how it works and answer your questions in this lively 30-minute live demo. Businesses are moving applications and communications to the cloud, which offers a unique opportunity to bridge the two with integrated capabilities. They are at a junction to break down silos and utilize tools that enable greater productivity. This webinar offers businesses an opportunity to learn how they can benefit from integrated communications and the options they need to consider. Join us on Friday, August 28 for a live online demo. Learn how RingCentral supports your mobile workforce with powerful communications that work on the desktop, desk phone, smartphone, and tablet, making everyone productive and professional no matter where they are. Understand how cloud-based solutions overcome many of the limitations of legacy PBX systems and make a BYOD environment easier and less costly to manage. See a demo of our powerful mobile app that lets you take HD voice, fax, text, online meetings, conferencing and more with you anywhere on your smart devices. •Use a single business identity with one business number. •Use advanced call control for call flip, transfer, park, recording, and more. RingCentral provides cloud business phone systems designed for today’s mobile and distributed business world. Join us for our weekly interactive product demos or our monthly eSeminars, which highlight best practices for leveraging today’s communications trends for your business.